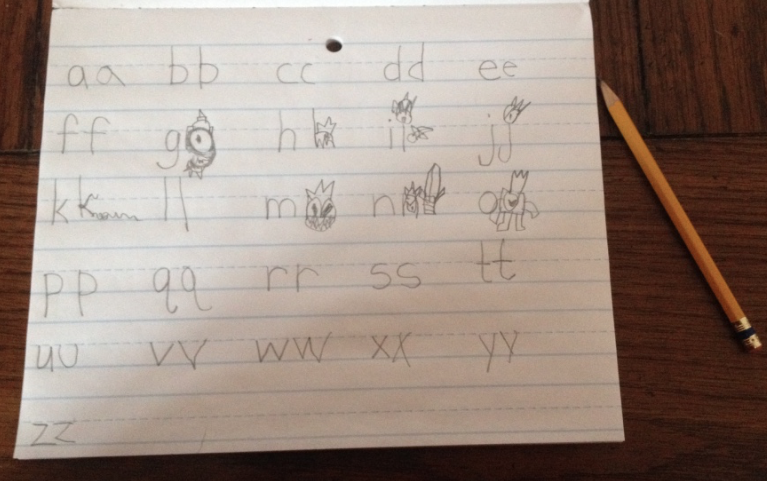 This is an image of my six year old's "decorated" alphabet. 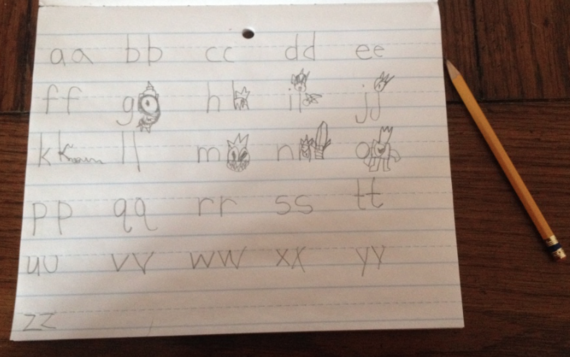 He gets to write his letters like this because we work on letters at home. I'm a former university professor, and I spent nearly 20 years teaching freshmen in college. One of the biggest lessons I learned from my students is that something is happening somewhere in our school systems that makes many children lose their curiosity toward learning. Of course, I'm not saying this happens to every student, but it happens too often. It worries me. But I was even more worried as a mom when my youngest son was being sent to the principal's office in preschool and came home from school one day calling himself "the bad kid." I knew I had to do something different. Our family made the decision to homeschool. If you've been following my blog, you know this meant quitting my full-time job and learning to live much more frugally. But we decided it was worth it. When my children were in public school, I had the notion that they were learning at school, so if I could get in some extra learning at home, that would be great but not necessary. I now understand just how necessary it truly is, and it's not as time consuming as you might think. It's just about seeing everyday activities, things that are a part of everyday life, as "teachable moments." With this in mind, I created a Top 5 "Homeschooling When You're Not" list to get interested parents thinking along these lines. Cooking with your child is a great opportunity to learn math, reading, and an important life skill. It's just about emphasizing these things while you do it. Talk about what you're doing with each step. It can be tough when you're busy, but if you can take the time to slow down for this a couple of times a week, it's totally worth it. At our house, we have lots of animals--chickens, ducks, fish, cats, a dog--and we have wildlife that visit us, everything from wild turkeys to chipmunks to crows. I'll write more later about the "kindness lessons" animals can help teach our children, but animals also provide amazing educational opportunities for learning about the lives and habits of different species. "Why do crows like shiny things?" and "Why do ducks whistle?" are just a few things we have researched. I know our chickens on our mini-farm have taught us more about the amazing personalities, intelligence, and resourcefulness of animals than I ever could have imagined. Just read. I'm a literacy teacher. I can't tell you what a difference this makes. Take 20 minutes every day, maybe every night before bed. And don't worry about making sure you're reading "great literature." You want reading to be fun. Once you get that, the rest will work itself out. When I was a kid, our parents just sent us outside to play, and we played all day. Mostly, I was bored. While I do think outdoor play and even a little boredom is important, I'm talking about outdoor exploration together. For homeschool geometry, we measured the circumference of the trees in our yard. We found we had one that was 88 inches in circumference! This is great stuff, and you don't have to be officially homeschooling to do it. If you know your child is studying something at school, see if you can find a connection in your yard. Talk about it. Explore it. While I know screen time gets a really bad wrap these days, there are some amazing educational videos and games out there. And, when you take 30 minutes and play the game with your child, it's all the better. Ted Ed has some amazing YouTube videos on everything from the size of an atom to narrative structures in literature, and they are so much fun. I'll write more about free online educational resources in future posts, but one great idea I wanted to share now is "Question of the Day." We started this in our family, and I'm learning a ton of stuff as well. I mean, I'm here to tell you. If you're in your 40's like me, the field of science has way more information than it did when we were in school. Homeschooling my youngest son has been one of the greatest experiences of my life so far. I've learned about how he learns, how he thinks, what works for him, what doesn't, and what inspires him. I wouldn't trade this experience for anything, and I'm looking forward to our second year together. But I know not everyone can do this. Not everyone can quit their full-time jobs, and not everyone feels comfortable as a teacher. But, if you're a parent, you're a teacher. You don't have to be a formal homeschooling family to bring homeschooling into your home. Summer vacation is a great time to start!